Unfortunately, when some of us hear the words vegetarian and healthy together, we imagine a meal that probably isn't very exciting. However, changing that for you is Karlo Art Kitchen and Cafe, the newest eatery in Deccan Gymkhana. 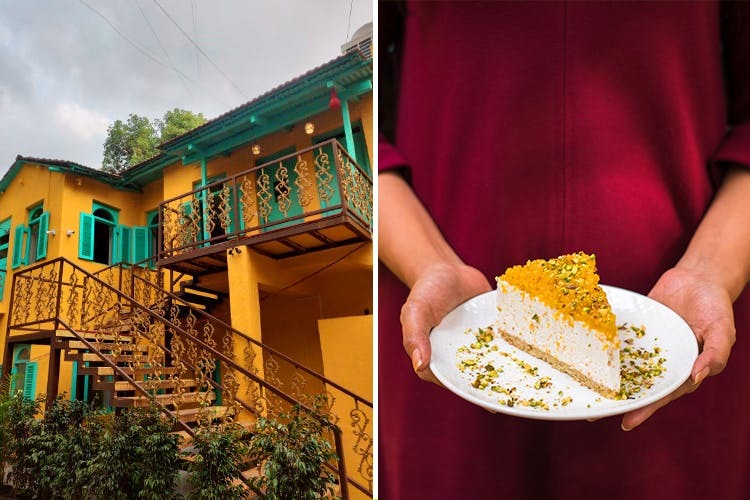 The team behind Karlo, Keertida - Chef Partner and Radhika - Head Pastry Chef, has done a great job at turning a lovely bungalow located in the green lanes of Deccan into a bright and happy eatery. Lots of sunshine, yellow and blue walls, tiny rooms to allow privacy, a large outdoor section and a cute balcony with lots of greenery is what Karlo promises you in terms of ambience. We went there for a meal and while we had a super large meal, our favourites were the roasted garlic soup, bakarwadi chaat, the bella pasta, eggplant roll-ups and the magic mushrooms. What stole our heart was the motichoor cheesecake, a perfect dessert for those that don't like it too sweet! We hear they have some interesting mocktails and are hoping to drop by again for those. The two chefs are very involved in every bit of what goes on at the eatery and if you're there, make sure you ask for them for some amazing recommendations.